When you came across adversities, only by working the ways out to solve them, can you really solve them eventually. When you meet adversity in playing poker, only by searching juiced deck of cards from Golden Sunshine can you get initiative right to take action in the game. Piatnik Club Star marked cards can be that juiced deck of cards to help you. Piatnik brand is made in Austria and Club Star is one kind of Piatnik poker cards, it is also a kind of playing cards with poker size jumbo index. 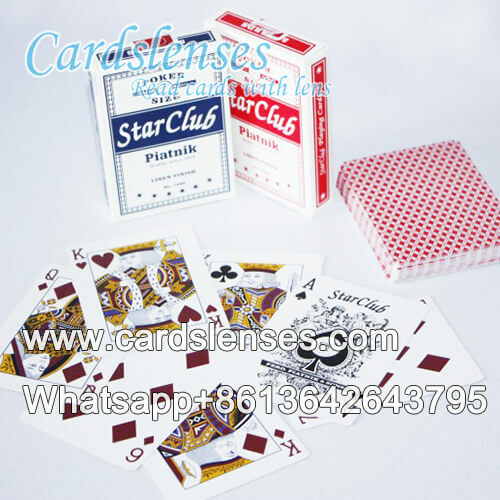 Piatnik Club Star marked cards are the cards marked with invisible ink on the back, and those marks we made can be seen only when wearing our infrared contact lenses. Marked cards contact lenses and marked poker deck is the combination that makes chances happened. When playing poker games, those who using marked cards and contact lenses will have more chance to win games, and those never know marked cards will always lose the games. You can buy our marked cards and contact lenses directly online, or you can send your cards to us, we promise providing the best quality marks on the cards.